I got a package in the mail this week. I knew it was on its way but had nearly forgotten, so seeing it in the postal box and tearing it open brought a Christmas morning thrill. At last, the promised September 2012 issue from the Egg Artistry Guild of Australia. And on page 19 I found an article with my name and some photos of my eggs. I’m practically famous! In case you’re wondering, here’s the path that led to this article. 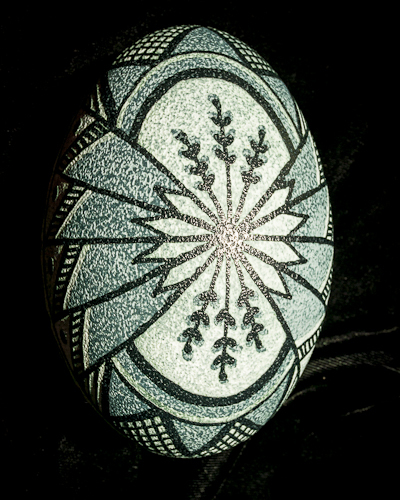 At the egg retreat in July I took a class on etching emu eggs and posted a photo of the finished egg to my pysanky chat group. The editor of the Australian Guild saw it, contacted the owner of Pysanky USA, the online store that sponsored the retreat, who called me to ask permission to pass on my information. A flurry of emails back and forth and voila, people in Australia are now reading my one page feature. Small world, huh?